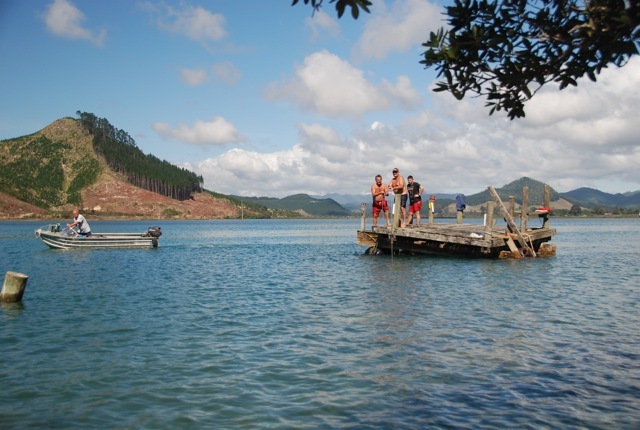 A couple of months ago the jetty was towed back into position by a determined team of locals (praise be! ), it has been held in place with chains and straps as a temporary measure but now help is needed to finish the job. The jetty platform is readied for its ride back to its rightful place. 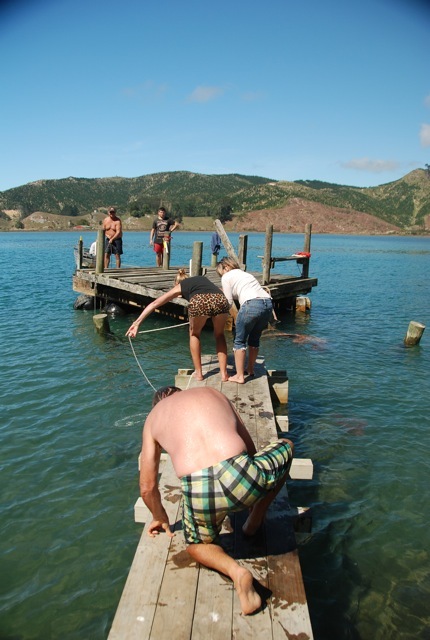 Mussel floats provided the buoyancy needed to move the jetty. On Saturday May 16 between 11am and 1pm (low tide) there is going to be a low-key working bee to cement rocks around the poles of the jetty platform. This is not meant to be a long-term solution but it will at least afford the jetty some protection from winter storms. Strong backs and arms are needed (at least 4-5 people) to move some rocks and carry bags of cement mix. The working bee for the jetty foundations was a success, with a good turn out and a good result. It won’t go anywhere next extraordinary weather event, just break up….) A special thanks is owed to Bunnings who came through on the timber materials. Thanks to the organisers and everyone who came along to help, our jetty lives to fight another day!